State Bank of India has disclosed 2000 vacancies for the candidates who are interested in Probationary Officer. To do the application and to get recruited, it is very important that the candidate must fulfill the eligibility criteria. So, first of all, they should know the criteria for eligibility which they must satisfy. Here on this page, we are providing the very important factor of the PO recruitment i.e. 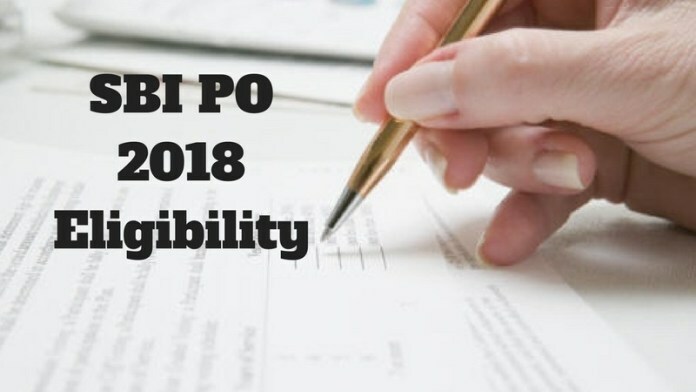 SBI PO 2018 Eligibility. You can get the qualification criteria, age limits, reservation policy etc on this page. The candidates must match a certain level of eligibility which is mandatory for the recruitment. In case, the authority will get any incorrect and invalid information of the candidate then immediately the candidature will be canceled. For more details regarding SBI PO 2018 Eligibility, you can scroll down this page. The minimum set of requirements that a candidate must possess is given here. You can check it from below. SBI has also provided some facilities to the reserved category candidates. All the details are given on this page. The prelim exam of the candidates will be held on three days i.e. July 01, 07, and 08, 2018. The candidates must have done the Graduation in any of the disciplines from a recognized Institute or University. The candidates who are in the final year of the graduation can also apply but if they will be called for the interview, they must submit the proof of having passed the graduation examination on or before August 31, 2018. Those who are having the integrated dual degree (IDD) certificate must ensure that the date of passing IDD must be on or before August 31, 2018. The date which will be considered as the passing date is the date available on the mark sheet or provisional certificate issued by the respective authority. If the result was posted on the website then the date on which the result was out will be considered. The candidates must fill the percentage of their obtained marks in graduation on the application form. If the candidate will be called for the interview then the norms for the conversion of grade into percentage released by the respective authority must be submitted. Note: Cumulative age relaxation will not be applicable to any of the candidates. Candidates who will be found guilty in repayment of Loans/ Credit Card dues or against whose name adverse report of Cibil or other external agencies is not eligible. Those who are having the report regarding character & antecedents, moral turpitude are not eligible. Visual Impairment: Those who are suffering from the total blindness, or having the visual acuity less than 3/60 or 10/2000 or having the low vision i.e. Visual acuity not exceeding 6/18 or less than 20/60 up to 3/60 or up to 10/200 comes under this category. frequencies in both ears have been considered in this category. Locomotor Disability: It includes the candidates whose one arm is affected (Right or Left) or one leg is affected (Right or Left) or one arm & One Leg are affected or both legs are affected but not arms. Candidates must mention the name of the scribe on the application form. Both candidate and the scribe must possess all the required documents to submit at the time of the exam. Candidates will be eligible for the compensatory time of 20 minutes for every hour of the examination. The applicants must arrange his/ her own scribe at his/ her own cost.